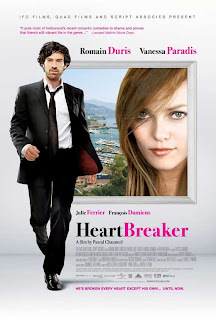 Some things are better in French; if Heartbreaker (2010) had been an American romantic comedy (something I suspect will happen) then I would have not been tempted to watch it. LoveFilm is great, you can try films you would not normally bother with and believe it or not I quite enjoyed it. Set in Monaco for most of the film, and coupled with Vanessa Paradis smile, makes this a pleasure to look at. Daft plot, but never mind, Alex Lippi, his sister and her husband are hired to convince women to end unhappy relationships. They are commissioned by a rich businessman to persuade his daughter (Paradis) to break up with her fiancé; I said it was a daft plot! Romain Duris, better known for more serious roles in films such as The Beat That My Heart Skipped (2005) and Moliere (2007), plays Alex Lippe and Julie Ferrier and Francois Damiens star as Lippe’s sister and brother-in-law. Yes ok it was funny in a silly sort of way and yes it made a change!